There was something mysterious and a little magical about hearing there was “an earlier Peter.” Reading his “origin story” was very strange to my Disney-accustomed brain–as it might be to you if you’ve never read it–but it had a haunting charm. It was like finding a worn box of quaint treasures that once served long-forgotten purposes. 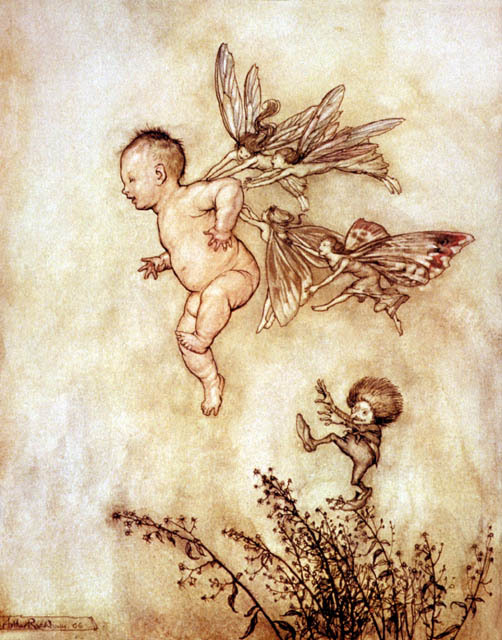 Some of Arthur Rackham’s famous 1906 illustrations. The beautifully-written The Little White Bird, first published in 1902, was an episodic novel meant for adults, and had dashes of social commentary and plenty of whimsy. Most whimsical of all were the chapters about “Peter Pan,” envisioned by Barrie as a week-old infant who escapes his nursery and flies to Kensington Gardens to live with the birds and mischievous fairies, who move about the park freely after “Lock-Out Time” (when the park closes to visitors). There’s something bittersweet about those chapters, specifically the idea of baby Peter unable to resist staying in the Gardens, and eventually realizing he can never go home. I can’t help wondering if there was a subconscious (or conscious) connection between Barrie’s story and the high infant mortality rate at the time. Inspired by the long stage tradition of fairy plays and pantomimes, Barrie decided to write a play around his Peter Pan, upping his age to about 12 and creating a magical island called Neverland and a host of new characters. 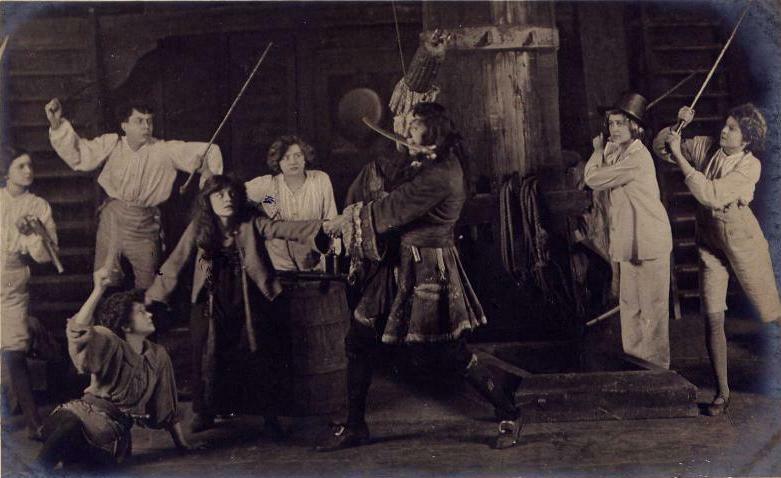 The resulting 1904 production, Peter Pan; The Boy Who Wouldn’t Grow Up, was a huge success–perhaps even more than Barrie expected. In 1905 it was brought to Broadway (where Peter was played by Maude Adams) and it soon reached the status of a frequently-revived classic. An image from the original 1904 production. Playing a role in Peter Pan was considered a badge of honor by any actor or actress, and it’s likely that more than one Hollywood actor was first inspired by a childhood viewing of the famous play. Colleen Moore, for instance, vividly recalled seeing it as a tot: “Tears were running down my face as Peter Pan came down to the floodlights and spoke to the audience: ‘All the children who believe in fairies raise their hands. If you believe, you can save Tinkerbell. '” Little Colleen didn’t just raise her hand, she stood up and shrieked that she did believe in fairies, she did! Buoyed by the audience’s laughter, she decided then and there that entertaining people was for her. Despite its popularity, we almost didn’t get to enjoy Peter Pan today. For decades the last copy of the film was thought to have vanished in the late ’20s; fortunately, in 1971 a crisp print was discovered in Rochester, New York. The film went through a wringer of copyright issues which fortunately seem to have been resolved. A lovely restoration debuted in the ’90s, and it’s been available to new generations ever since. While viewing Peter Pan recently, I was struck by a little of that same wonder I had experienced when reading The Little White Bird. Here was cinema’s first Peter Pan, drawing directly on a 1900s play that so many generations back then knew and loved. Elements of the play that are usually omitted today–such as Wendy’s romantic feelings towards Peter, which he doesn’t reciprocate–are faithfully included. The innocence of these scenes added more depth and poignancy than I had expected. Wendy, despite tantalizing glimpses of an eternal childhood, is still destined for adulthood and all the entanglements and responsibilities it includes, while Peter will not–or, perhaps, can not. He will forever have thrilling adventures and play on his panpipes, but he will also lack a mother and will never have a family of his own. In the words of Barrie, he will remain “gay and innocent and heartless,” a lonely figure both inspiring and tragic. Barrie apparently commissioned the statue and had it erected secretly on the night of April 30, 1911–as a surprise to any children playing in the park the next day. Thus was the man’s love of wonder and fantasy. 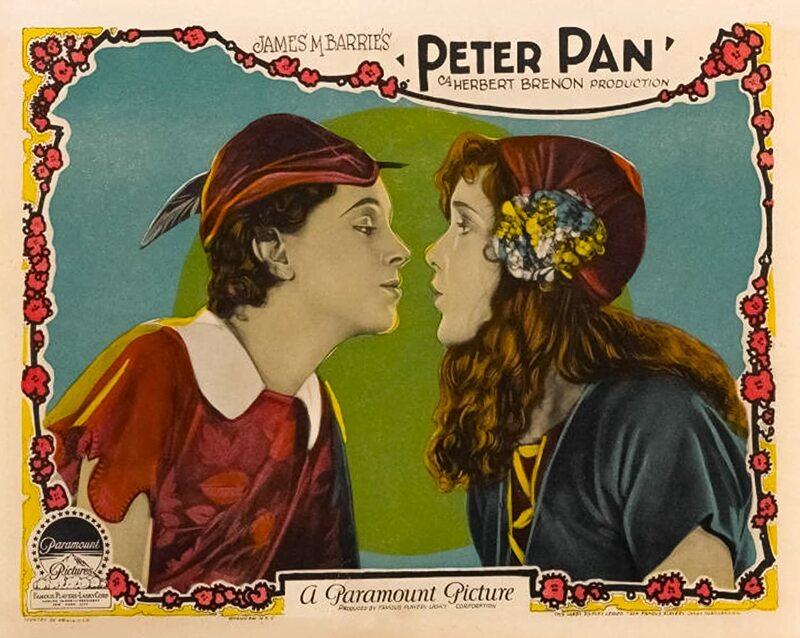 I’m grateful that the 1924 Peter Pan exists, for its the closest we can get to experiencing some of the delight audiences felt from Barrie’s play, which was such an important cultural milestone. It had debuted at a good time, at the cusp of a new century already promising greater technological advancement and communication than ever before. It was a promising future that those Edwardian audiences were facing, but as we know now it was an uncertain one too. 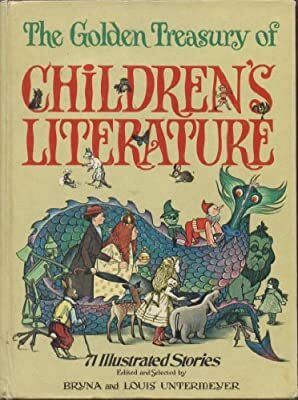 This entry was posted in Thoughts on Films and tagged 1920s, Betty Bronson, Ernest Torrence, fairytale films, fairytales, Herbert Brenon, J. M. Barrie, Kensington Gardens, London, Peter Pan by Lea S.. Bookmark the permalink. I was one of the lucky ones to see the debut of the restoration in Rochester, NY, with live orchestra – blew me away – love forever! :-O What a night! There’s few things better than seeing a freshly-restored silent on the big screen with live music–it’s an experience like nothing else. One of the interesting tidbits I’ve come across in my research of photographer Nelson Evans is that Nelson’s sister Claire was very good friends with Betty Bronson. There’s several newspaper items about the 2 of them having lunch at Montmartre. When Betty got married in 1932, Claire was one of the witnesses. Would love to know more about their friendship.